FuRo took the concept from Asimov's science fiction and used it to create robotic concept vehicles called Hallucigenia-I and Halluc-II for their dream-like hallucinogenic look. And look and wonder! 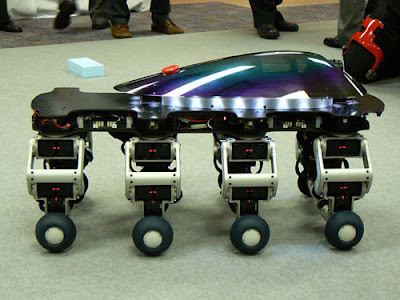 The working prototypes of these vehicle, which has 8 wheels on the end of 8 robotic appendages, can move in any direction and can climb over uneven terrain! "fuRo" is an old Italian word that means existence, life, essence. The fuRo logo is modeled on chromosomes, symbolizing the evolution of robots. FuRo's robot development capabilities are world-class. Robot technologies will be an essential element in the formation of the society, life and culture of the future. At fuRo we have gathered the technologies and technologists needed to conduct R&D in next-generation technologies. The morph team that made up the robot development group at the Japan Science and Technology Agency has relocated in total to the Chiba Institute of Technology. fuRo is at the core of collaborations within and beyond the academy to develop the technologies of the future. fuRo executes robots of the future never seen before. Projects including joint research with the world-renowned industrial designer Shunji Yamanaka of Leading Edge Design inject the arts into robot technology and reach beyond conventional concepts. New machines of the future result from the incorporation of product design techniques. We are envisioning and delivering new ways of living for human beings. fuRo creates new robot industry sectors. Numerous joint research and development projects are already underway with several major companies. With robot technologies at their core, they involve the fusion of a wide range of technologies. We are engaged in active collaboration with the private sector to develop the underlying technologies for new industrial sectors and foster market demand for their product with the aim of bringing about new robot technologies and business sectors. My apologies to all Isaac Asimov fans - for the creature described in these blogs is not the product of his amazing fiction but is a divine design from the mind of God of Israel himself. Hallucigenia is an extinct genus of animal found as fossils in the Middle Cambrian-aged Burgess Shale formation of British Columbia, Canada, represented by the species H. sparsa, and in the Lower Cambrian Maotianshan shale of China, represented by the species H. fortis. The genus name was coined by Simon Conway Morris when he re-examined the various specimens of Charles Walcott's Burgess Shale worm genus Canadia in 1979. Conway Morris found that what Walcott had called one genus in fact included several quite different animals. One of them was so unusual that nothing about it made much sense. Since the species clearly was not a polychaete worm, Conway Morris had to provide a new generic name to replace Canadia. Conway Morris named the species Hallucigenia sparsa because of its "bizarre and dream-like quality" (like a hallucination). 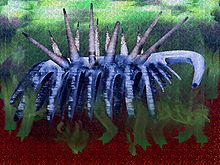 Hallucigenia was initially considered by Stephen Jay Gould to be unrelated to any living species, but most palaeontologists now believe that the species was a relative of modern arthropods. I would like to point out to all those science oriented people who can see life only in terms of questions of evolution that this amazing little creature is present already in Lower Cambrian.